A universe that is vaster, darker, and stranger than anything previously imagined comes to life in H. P. Lovecraft’s short stories. His “cosmic horror” shows that humans are insignificant in light of the vastness of time and space. The Lovecraftian twist is that powers at work in the universe possess the potential for the ultimate destruction of mankind. Reprinted here are many of Lovecraft’s most famous works, including “The Call of Cthulhu” (1928), “The Dunwich Horror” (1929), and “The Shadow Over Innsmouth” (1936). These stories introduce readers to Lovecraft’s pantheon of “gods,” his fictitious New England geography and, of course, the Necronomicon, Lovecraft’s fictional book of occult secrets. The Call of Cthulhu and Other Dark Tales. By H.P. 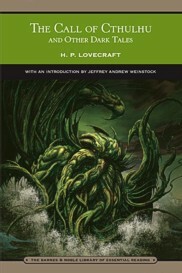 Lovecraft, With an Introduction by Jeffrey Andrew Weinstock. New York, NY: Barnes & Noble; 2009; ISBN 978-1-4351-1643-6; paperback; 480 pages.